In the days following my own experiences of miscarriage and stillbirth, I hungered for stories. I needed language for my grief, and I also needed the hope of a way forward, a path through a sadness that felt both unbearable and consuming. 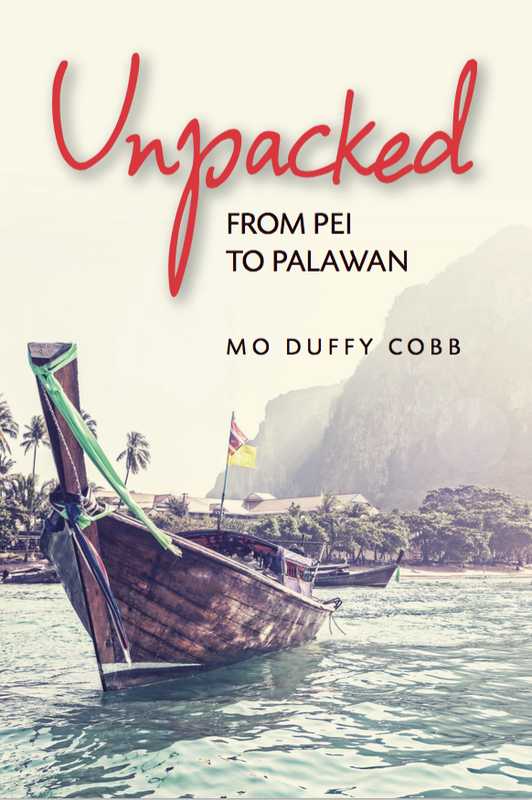 Mo Duffy Cobb's debut book Unpacked: From PEI to Palawan is the kind of memoir I was looking for then, and it is the kind of book that resonates with me still, several years removed from my losses. In it, Duffy Cobb, the founder and editor of online travel magazine Cargo Literary, tells the story of the journey she, her husband Mitch, and their toddler daughter Leila embarked on following the full-term stillbirth of a second daughter Tya. The family of three leaves their native Prince Edward Island and spends nine months on the road visiting twelve countries—among them Germany, Bali, and Vietnam. "My grief needed the whole world," Duffy Cobb writes in one of the book's opening chapters. "It needed isolation. It needed inspiration. It needed something to change, something to be released. It needed an answer." Her search for answers is an ongoing theme throughout the book, which is organized chronologically, each chapter describing a different segment of the family's travels. Like Elizabeth Gilbert's best-selling memoir Eat, Pray, Love, Unpacked details the quest of a woman driven to travel by a life unraveled and explores both grief and the possibilities of hope against the backdrop of some of the world's most beautiful and exotic locations. It is in London's Victoria Tower Gardens, for instance, early in her journey, that Duffy Cobb responds to the painful sight of a group of women pushing baby carriages, a trigger to which any mother grieving the loss of a baby can relate. On "the exterior grounds where large trees undulated in the breeze [and] teenagers threw Frisbees," she questions, "were my days of happy mothering over? Was I now merely damaged goods?" Here, and throughout the book, the writer's thoughts and emotions are firmly grounded in place in a way that is both relatable and evocative for the reader, especially for a reader who has also known loss. Because Duffy Cobb travels with her family, her narrative is also grounded by the realities of spousal conflict and toddler temper tantrums in a way that Gilbert's solo pilgrimage is not. For instance, in the Victoria Tower Gardens scene described above, Duffy Cobb's thoughts are interrupted by Leila asking about the possibility of a princess inside Westminster Palace. This moment of mother-daughter interaction is followed by a description of a frustrated Mitch attempting to fix a broken carrier backpack. Often, as in this scene, the narrator's moments of introspection and reflection are brief and scattered, as such moments often are in the real life of any person embedded in the rhythms and constraints of family life. Duffy Cobb's ability to capture this interplay between personal exploration and the demands of marriage and parenting lends a refreshing sense of credibility to her narrative. The view was wide from up here, the Bodhisattvas protecting this glorious place, a mountain of rock and prayer and sweat and tears, so high up now that we looked down upon those Chinese tourists who filed like ants up to a crumb. The Khmer kingdom in all its glorious splendour poured into us like we were molds. I, too, needed spiritual training, I just didn't know of what magnitude. After the loss of the baby I had fought so vehemently against religion, against heaven, thinking it was unethical or dishonest to perpetuate this lie for Leila, that she would be scarred or offended if her mother had never talked about God until the minute she needed him. Wouldn’t the hypocrisy confuse and upset her, like it did adults? It became so radically apparent that every single person on the planet lived with loss, and that I, on my planet of sunshine and rainbows, had everything in the world minus one eight-pound, brown-haired wonder who just might teach me the first thing I ever really needed to learn about life: you can't always get what you want. It is an important lesson, one that my own losses forced me to confront in a way that my otherwise privileged life had not. In sharing this lesson, Duffy Cobb leaves her readers with a form of hope, the sense that great loss can, in time, produce great and transformative insight. Abigail Waldron is a writer who lives in the Virginia suburbs of Washington, DC with her husband and two young daughters. You can find her online at abigailwaldron.com.